Kitimat River Park protects two parcels of small but highly productive old-growth Sitka Spruce and Red Cedar forest on the natural floodplain and fluvial terraces of the Kitimat River. It also protects Grizzly Bear habitat and culturally modified trees. Kitimat River Provincial Park is located about 6 km north of Kitimat and is on the west side of Highway 37, between the power transmission lines to the north and the Snowflake Community Fairgrounds to the south. Access into the park is by foot. Use NTS Map Sheet # 103 I/2. History - Kitimat River Provincial Park was designated as a Park on May 20, 2004, following recommendations from the Kalum Land and Resource Management Plan. 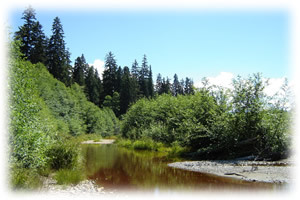 Conservation - Kitimat River Park is located in the CWHws1 biogeoclimatic zone (Coastal Western Hemlock, wet sub-maritime subzone, Submontane variant). This zone occurs at low to mid-elevations. In general, it is one of the wettest areas in BC and typically has cool summers and mild winters. Mean annual precipitation ranges from 100-440 cm. The park is situated on an active floodplain of the Kitimat River. Vegetation differences throughout the park depend on differences in bench height and frequency of flooding. The soils in active floodplains are usually poorly developed. High bench sites have seasonally fluctuating water tables, but only flood every few years. Forests are typically dominated by Sitka Spruce, however Red Cedar, Western Hemlock and Amabilis Fir are also present. The shrub layer is dominated by Devil’s Club. Small amounts of Salmonberry, Alaskan and Oval-leaf Blueberry and young conifers are also present in the understory. Spiny Wood Fern, Oak Fern, Foamflowers, Twisted Stock, and leafy mosses are also common in this plant community. Middle bench plant communities have high and prolonged water tables that limit conifer establishment. The most common species in this area are Black Cottonwood, Red-Osier Dogwood, Red Alder, and Salmonberry. The low bench plant communities are found adjacent to the river and back channels and are subjected to prolonged annual flooding, sediment erosion and deposition. The occasional Black Cottonwood is found in this area, but the most common species are willows along with Red and Sitka Alder. There are opportunities for salmon and steelhead fishing in Kitimat River, to the west of the park. Anyone fishing or angling in British Columbia must have an appropriate licence. There is a short (215 m) trail leading through the centre of the park. For your own safety and the preservation of the park, obey posted signs and keep to designated trails. Shortcutting trails destroys plant life and soil structure. The park is open to hunting but hunting opportunities are limited. Please refer to the British Columbia Hunting and Trapping Regulations for more information. Wilderness, backcountry or walk-in camping is allowed, but no facilities are provided in this park.